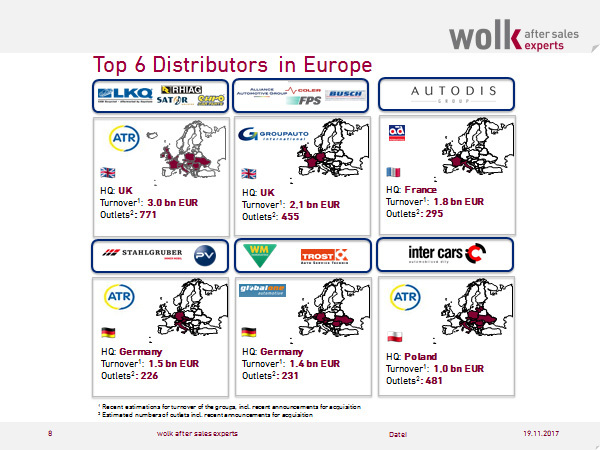 Major international purchasing cooperations such as ATR, Temot, Groupauto International, AD International and NEXUS Automotive International are still able to hold their positions in Europe, facing the growing market power of some of their members. The newcomer among the cooperations, Global One Automotive has also gained 38 members since its foundation in 2016. At the beginning of 2018, another member will join the Northern Irish national purchasing cooperation FG7. The continuous decline of parts dealers is one of the first consequences of the rapid consolidation in the European car parts distribution and the ensuing restructuring of the market. With the increasing involvement of North American companies such as LKQ (USA), Uni-Select (Canada) or Genuine Parts Company (USA) in the European IAM, a different understanding of the market is coming to Europe. For example, the North American market does not have as many distribution levels as the European market and companies like Genuine Parts Company distribute about 90% of their own brands (NAPA). An increasing share of e-mobility, technological developments, especially in the digital sector, consolidations in the parts trade, the struggle for data sovereignty and political interventions will shake up the foundations of the IAM, even though their impact often only becomes apparent with a delay. The IAM will have to face these developments. Either way. 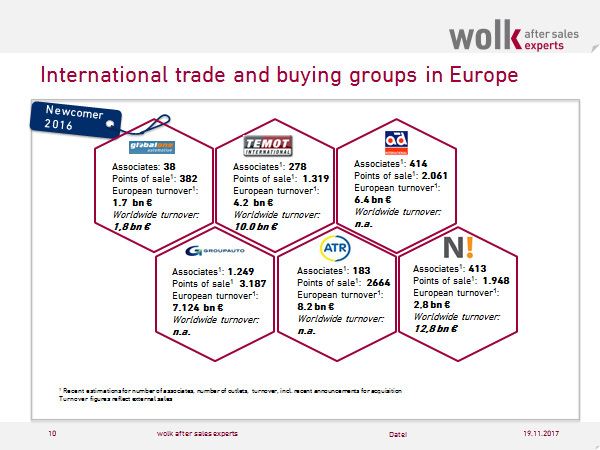 The report is based on the After Sales ACCESS database from wolk after sales experts, with more than 8,000 registered companies in Europe. Country reports are available separately.